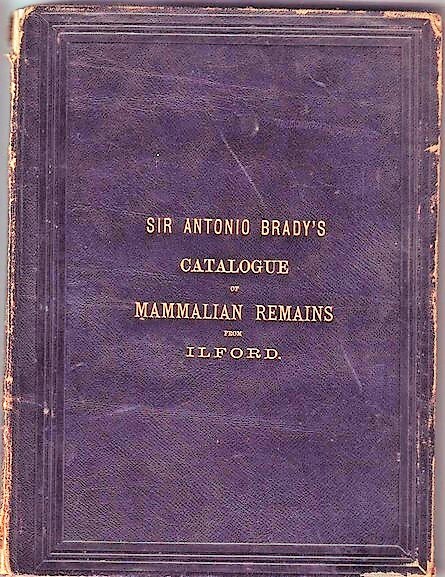 Sir Antonio Brady (1811-1881), civil servant and fossil collector was born on 10th November 1811 at Deptford, Kent. 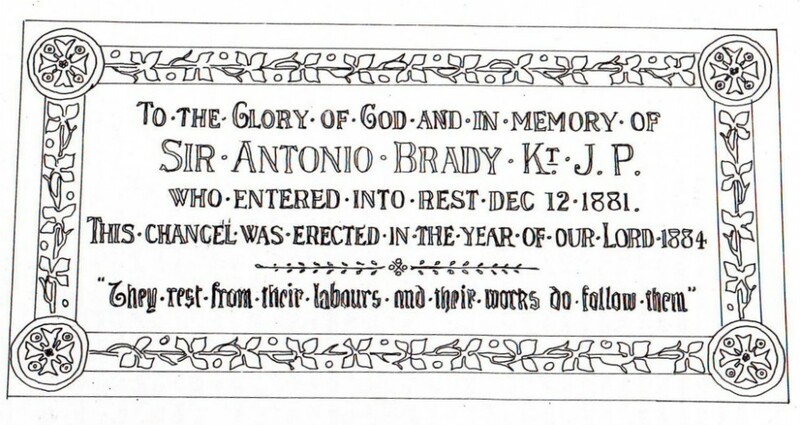 He died suddenly on 12th December 1881 at Stratford, Essex and was buried on 16th December in the graveyard of St. John’s church, Stratford, Essex. Brady was knighted on 23rd June 1870. Brady was a great philanthropist and was always ready to help the poor. He prided himself on the simplicity of his tastes. In appearance Brady usually sported long side whiskers or beard. He had penetrating clear blue eyes and brown hair. Brady resided at Stratford from 1837. By 1851 he was living at 7 Forest Lane, Maryland Point, Stratford, Essex where he died aged 70, of heart failure in 1881. Brady’s parents were Anthony Brady (1777-1847), a navy storekeeper, and Marianne Perigal (1780-1868). 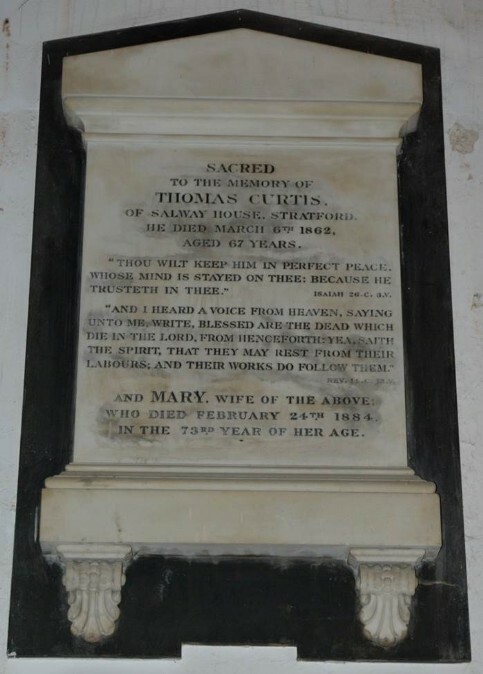 They married in 1810 in Devon. Antonio was the first of their eight children of six sons and two daughters. 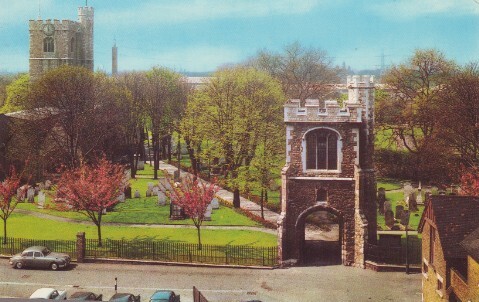 Antonio married Maria Kilner (1812-1897) at All Saints’ church West Ham in 1837. Antonio and Maria Brady had two sons and two daughters. Their first child, Nicholas Brady (1839-1911) became vicar of Wennington, Essex. Their second child, Fanny Brady (1840-1917) married William Emery (1825-1910) who later became Archdeacon of Ely. Antonio Brady was a civil servant in the Admiralty. He steadily progressed and eventually became Superintendent of Contracts shortly before he retired in 1870. Brady was knighted shortly after his retirement. He travelled widely. Brady was a Conservative and active member of the Church of England. He was educated at Colfe’s school Lewisham. 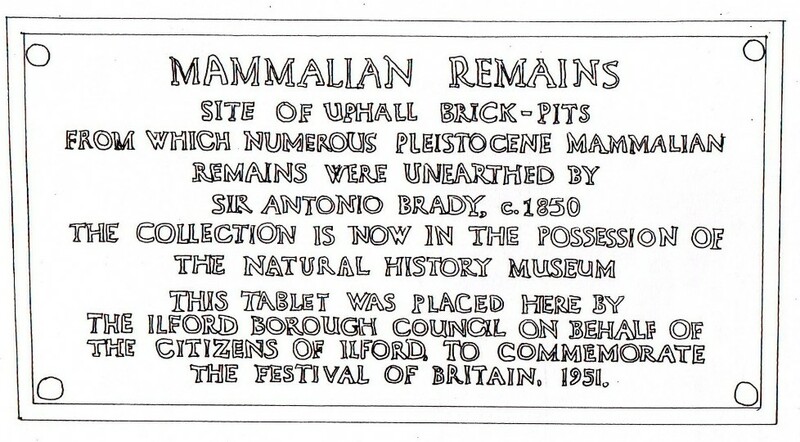 Brady started to collect Pleistocene mammalian fossils from Ilford about 1844. 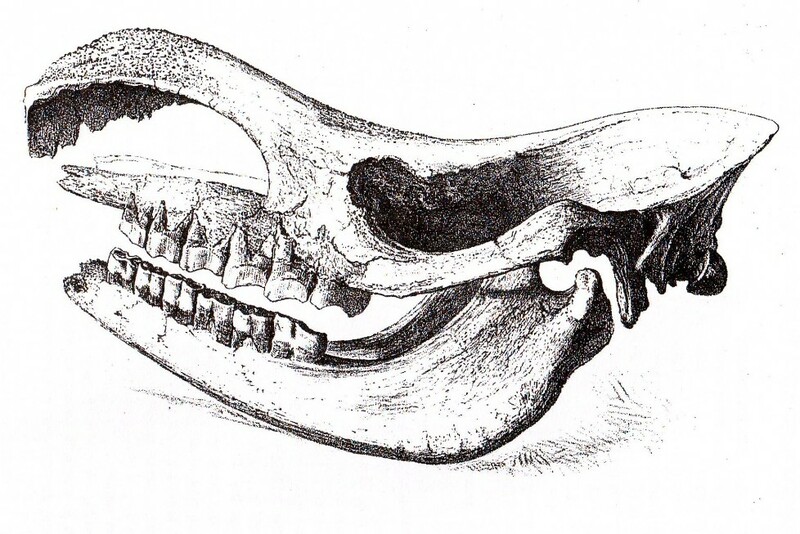 He devoted a large amount of his spare time and money to search for and dig up fossil bones. Mrs. Mary Curtis, the wife of the owner of an Ilford Brick Pit would send Brady a letter when the quarrymen uncovered any bones. 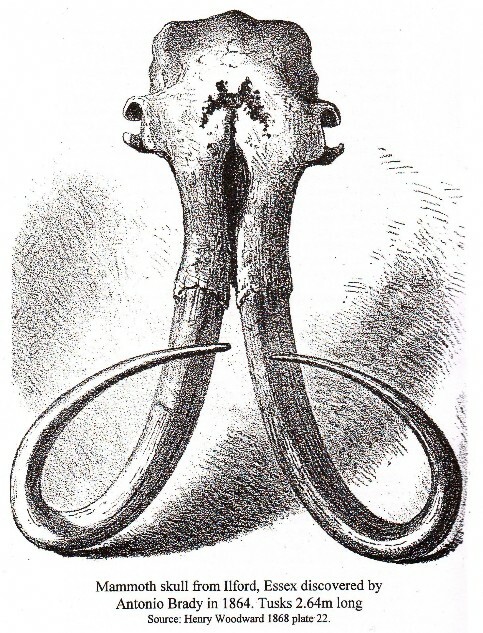 His finest specimen, found in 1864, was a complete mammoth skull with both tusks. 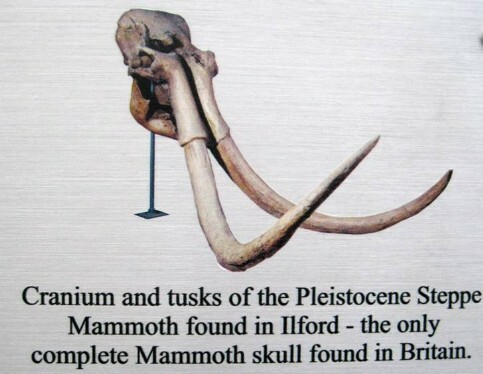 Brady relinquished his claim to this specimen in favour of the British Museum. He spared no effort to excavate the fragile fossil bones and used plaster of Paris, strong boards and nail bar iron. 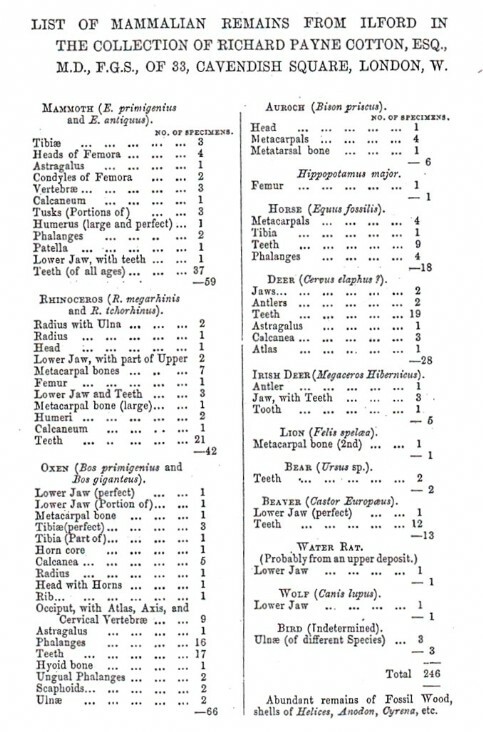 Brady eventually sold his specimens for £525 to the British Museum in 1874. 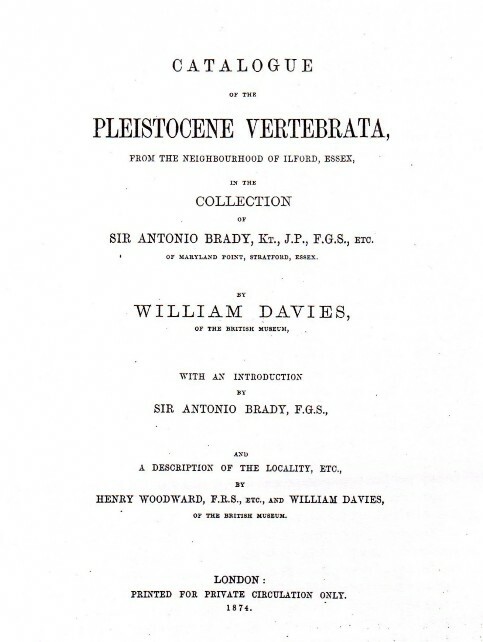 A catalogue of his specimens, compiled by William Davies (1814-1891), was privately circulated in 1874. 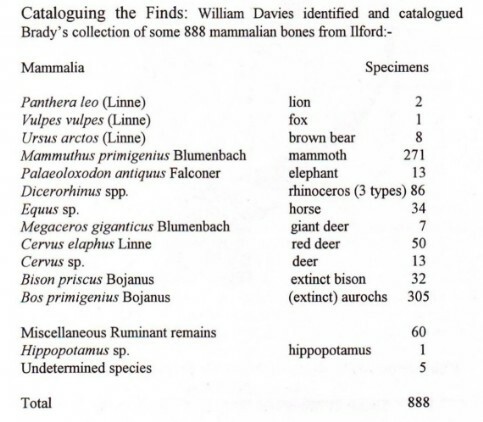 This listed 888 remains including lion (2 items); fox (1); brown bear (8); mammoth (271); elephant (13); rhinoceros – three types (86); horse (34); giant deer (7); red deer (50); deer (13); extinct bison (32); aurochs (305); miscellaneous ruminant remains (60); hippopotamus [erroneous] (1) and undetermined (5). Brady was elected a Fellow of the Geological Society in 1862. He was elected to membership of the Geologists’ Association in 1872. He was an original member of the Essex Field Club which he attended and promoted. Brady published little on geology. 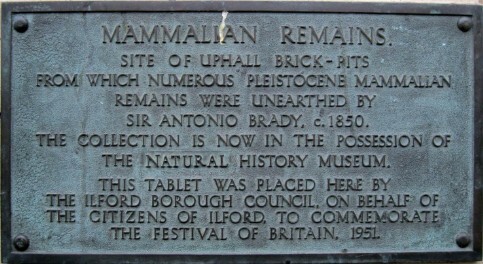 His lasting legacy is his magnificent collection of fossil mammalian bones from the Pleistocene brick earth and gravels of Ilford, Essex, about 210,000 years old, which are still housed in the Natural History Museum. Brady, N. and Woodward, H. 1882. In Memoriam: Sir Antonio Brady, J.P., F.G.S., &c. Transactions of the Essex Field Club. Vol. 3 pp.94-101. George, W. H. 1999. 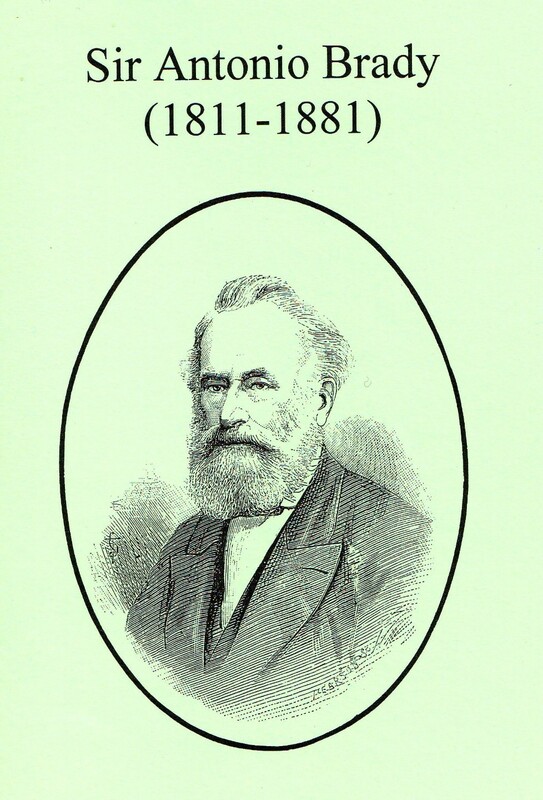 Sir Antonio Brady (1811-1881) civil servant, fossil collector and philanthropist of West Ham, Essex. ISBN 0953409202. 36 pages. Fossil Collection at Natural History Museum; Museum of London. Archives: Some letters at Natural History Museum. 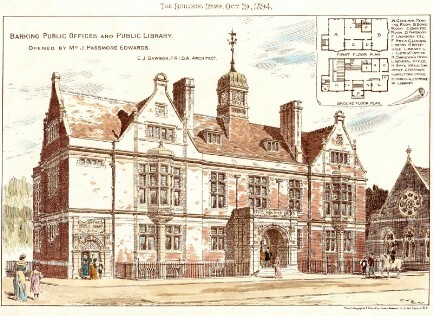 Some Family Papers at Essex Record Office, Chelmsford. Likeness: Brady, N. and Woodward, H. 1882 p. 95. Wealth at Death: Estate valued at £21,337. 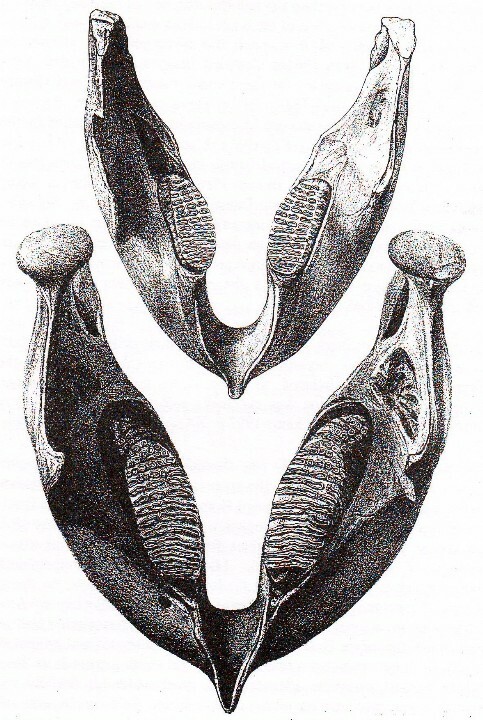 Lithograph drawings of mammoth mandibles collected by Sir Antonio Brady from Ilford Essex. 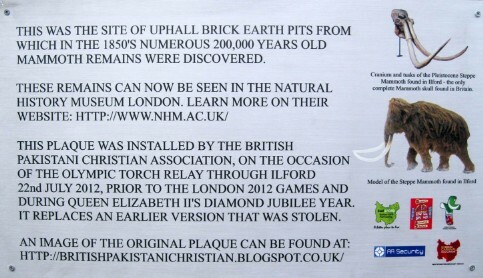 Thomas Curtis was the owner of some of the Ilford Brick Pits. 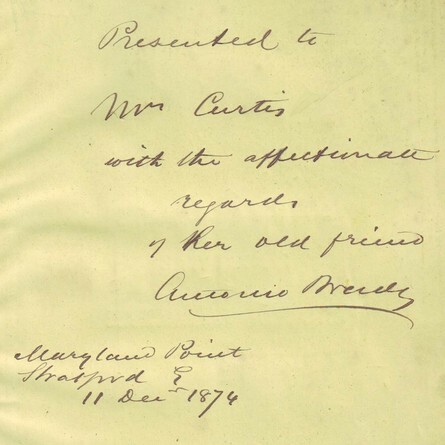 When large bones were found Mrs. Curtis would write to Antonio Brady. He would them arrange for the fossils to be removed and compensate the labourers for any loss of wages.